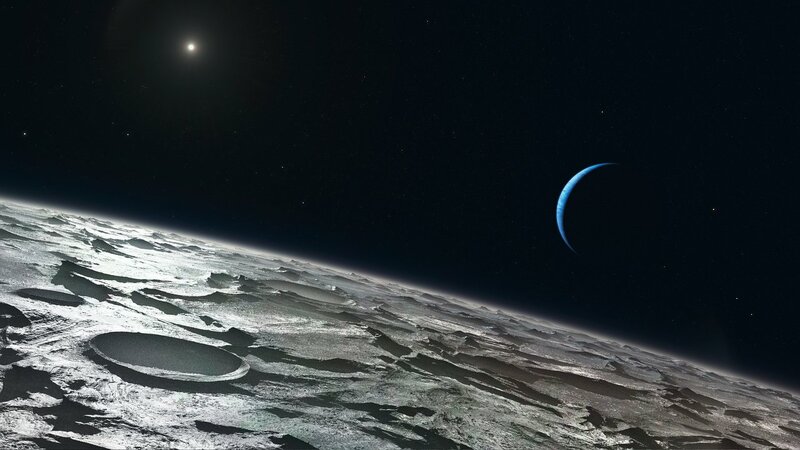 According to the first ever infrared analysis of the atmosphere of Neptune's moon Triton, summer is in full swing in its southern hemisphere. The European observing team used ESO's Very Large Telescope and discovered carbon monoxide and made the first ground-based detection of methane in Triton's thin atmosphere. These observations revealed that the thin atmosphere varies seasonally, thickening when warmed. "We have found real evidence that the Sun still makes its presence felt on Triton, even from so far away. This icy moon actually has seasons just as we do on Earth, but they change far more slowly," says Emmanuel Lellouch, the lead author of the paper reporting these results in Astronomy & Astrophysics. On Triton, where the average surface temperature is about minus 235 degrees Celsius, it is currently summer in the southern hemisphere and winter in the northern. As Triton's southern hemisphere warms up, a thin layer of frozen nitrogen, methane, and carbon monoxide on Triton's surface sublimates into gas, thickening the icy atmosphere as the season progresses during Neptune's 165-year orbit around the Sun. A season on Triton lasts a little over 40 years, and Triton passed the southern summer solstice in 2000. Based on the amount of gas measured, Lellouch and his colleagues estimate that Triton's atmospheric pressure may have risen by a factor of four compared to the measurements made by Voyager 2 in 1989, when it was still spring on the giant moon. The atmospheric pressure on Triton is now between 40 and 65 microbars — 20 000 times less than on Earth. Carbon monoxide was known to be present as ice on the surface, but Lellouch and his team discovered that Triton's upper surface layer is enriched with carbon monoxide ice by about a factor of ten compared to the deeper layers, and that it is this upper "film" that feeds the atmosphere. While the majority of Triton’s atmosphere is nitrogen (much like on Earth), the methane in the atmosphere, first detected by Voyager 2, and only now confirmed in this study from Earth, plays an important role as well. "Climate and atmospheric models of Triton have to be revisited now, now that we have found carbon monoxide and re-measured the methane," says co-author Catherine de Bergh. Of Neptune's 13 moons, Triton is by far the largest, and, at 2700 kilometres in diameter (or three quarters the Earth’s Moon), is the seventh largest moon in the whole Solar System. Since its discovery in 1846, Triton has fascinated astronomers thanks to its geologic activity, the many different types of surface ices, such as frozen nitrogen as well as water and dry ice (frozen carbon dioxide), and its unique retrograde motion . Observing the atmosphere of Triton, which is roughly 30 times further from the Sun than Earth, is not easy. In the 1980s, astronomers theorised that the atmosphere on Neptune's moon might be as thick as that of Mars (7 millibars). It wasn't until Voyager 2 passed the planet in 1989 that the atmosphere of nitrogen and methane, at an actual pressure of 14 microbars, 70 000 times less dense than the atmosphere on Earth, was measured. Since then, ground-based observations have been limited. Observations of stellar occultations (a phenomenon that occurs when a Solar System body passes in front of a star and blocks its light) indicated that Triton’s surface pressure was increasing in the 1990's. It took the development of the Cryogenic High-Resolution Infrared Echelle Spectrograph (CRIRES) at the Very Large Telescope (VLT) to provide the team the chance to perform a far more detailed study of Triton’s atmosphere. "We needed the sensitivity and capability of CRIRES to take very detailed spectra to look at the very tenuous atmosphere," says co-author Ulli Käufl. The observations are part of a campaign that also includes a study of Pluto (eso0908). Pluto, often considered a cousin of Triton and with similar conditions, is receiving renewed interest in the light of the carbon monoxide discovery, and astronomers are racing to find this chemical on the even more distant dwarf planet. This is just the first step for astronomers using CRIRES to understand the physics of distant bodies in the Solar System. "We can now start monitoring the atmosphere and learn a lot about the seasonal evolution of Triton over decades," Lellouch says. Triton is the only large moon in the Solar System with a retrograde motion, which is a motion in the opposite direction to its planet's rotation. This is one of the reasons why Triton is thought to have been captured from the Kuiper Belt, and thus shares many features with the dwarf planets, such as Pluto. This research was presented in a paper to appear in Astronomy & Astrophysics (“Detection of CO in Triton’s atmosphere and the nature of surface-atmosphere interactions”, by E. Lellouch et al. ), reference DOI : 10.1051/0004-6361/201014339. The team is composed of E. Lellouch, C. de Bergh, B. Sicardy (LESIA, Observatoire de Paris, France), S. Ferron (ACRI-ST, Sophia-Antipolis, France), and H.-U. Käufl (ESO).